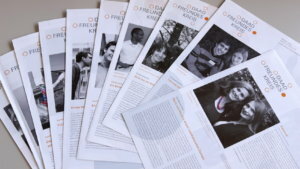 The newsletter of DAAD Alumni & Friends (DAAD-Freundeskreis e.V). informs you about the activities of the Association three times a year. In addition to reports from scholarship holders and members, you will also find contributions from DAAD Alumni Associations abroad. Please write an email to: freundeskreisdaad.de. And if you miss an issue, you can go to the newsletter archive. A printed copy of our newsletter is also sent as a supplement to the DAAD alumni magazine LETTER. This is automatically sent to scholarship holders from abroad and members of DAAD Alumni & Friends. DAAD alumni who are not members of the Association can subscribe to LETTER. Find the online version here.